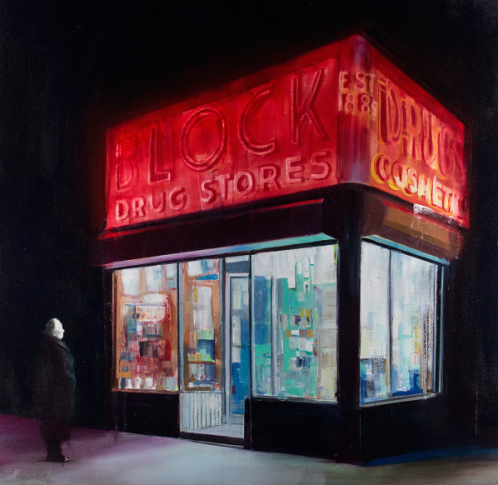 Jonathan Levine Gallery is currently exhibiting their third Brett Amory show. ‘This Land is Not for Sale: Forgotten, Past and Foreseeable Futures’ is presenting a series of oil on canvas of accurate precision. 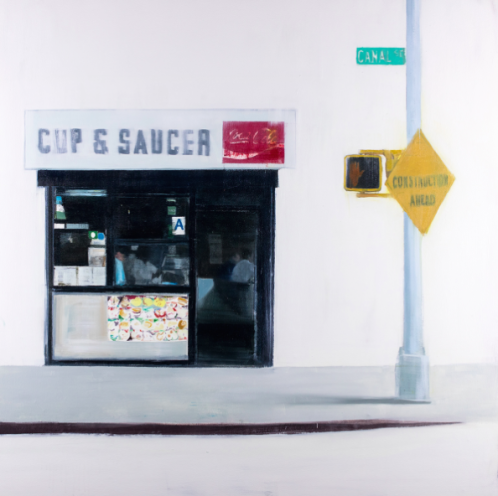 The Californian-based artist depicts common and quotidian visions of big cities’ little corners. Remembering the realist paintings of David Hockney, through his wandering characters, empty streets and neighborhood cafes, Amory delivers detailed streets views. Drug stores, candy shops, bars, kiosks, they all are represented with a meticulous accuracy that can, at first sight, mislead the viewer to think about it as a photograph. That socio-demographic feeling persists in all of the works that act as a documentary testimony of the appearance and disappearance of the 20th century urbanity.